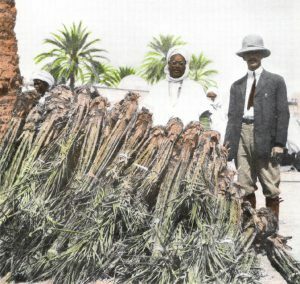 In the later 19th century and early 20th century, USDA Scientists and agricultural specialist conducted date safaris to Iraq, the Arabian peninsula and North Africa in the quest to discover and select varieties of date palms which were potentially favorable candidates for the southwestern deserts of the United States. How did date palms get to California? In a major detour that spanned several millennia, date palms found their way from the Garden of Eden in the Middle East to the Mediterranean coast of Spain. In the Age of Discovery, European explorers brought them via Cuba and Florida to Mexico. Moving north from Mexico, the trees became part of the Jesuit and Franciscan missions of Southern California in the mid 18th century. These majestic palms contributed to the stately appearance of the missions, but, as they were derived from seedlings, did not bear good fruits and produced poor yields, especially when growing in coastal proximity. It took another hundred years before some inland growing seedling-derived date palms in Sacramento Valley, Yuma and other places in Western Arizona and California were recognized to produce tasty fruits in promising quantities. At the same time, probably in 1876, the first cuttings (off-shoots), harvested from elite middle-eastern trees, arrived in California. However, none of those early imports survived due to the limited knowledge and experience of the growers that cultivating them. Little more than 100 years ago, in 1900, offshoots from elite varieties (mostly Deglet Noor) arrived in the American Southwest from Algeria through an effort of a (then) very imaginative and enterprising US Department of Agriculture (USDA). For 30 years, the USDA continued to import offshoots from several countries of the Maghreb and the Middle East (including Iraq), select superior trees and work out techniques for the profitable production of attractive fruits. In 1903, Deglet Noors from Algeria were also planted in a private effort near Mecca in California’s Coachella Valley. It should be mentioned that it took an enormous personal and financial sacrifice, as well as tricky administrative and diplomatic hurdling to move high quality offshoots from their African mother plants into the deserts of the American West. It started with an adventurous and often dangerous camel-aided expedition and ended in laborious deep-well digging at home. In 1913, the import of offshoots reached a height, and the Coachella Valley was established as the center of American date cultivation, with its cradle between the towns of Thermal and Mecca. Today hundreds of growers, large corporate ones but also numerous small family-run date gardens, produce between 20,000 and 30,000 tons of dates per year, mostly of the varieties Medjool and Deglet Noor. 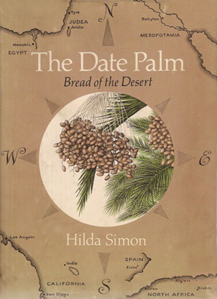 The 1913 imports from Algeria and Tunisia to Thermal/Mecca were directed by Henry Simon, and his and the date’s adventurous California story was told by his daughter Hilda in her lovingly written book The Date Palm: Bread of the Desert, 1978, from which most of the information given here was taken.